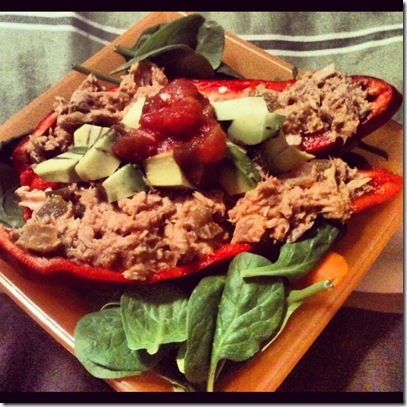 WIAW,Take Out, Raw Stuffed Peppers. So I’m now on SPRING BREAK! Anyway, I’m looking forward to this break because I get to see my family & friends! & then meeting my Grandpa for lunch with my Brother! Then headed to dinner with some friends! Speaking of FOOD, today is What I Ate Wednesday! 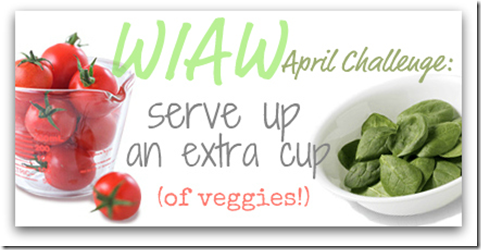 & APRIL is serve up an extra cup of VEGGIES! for hosting this healthy party! and show you how I like to incorporate MORE VEGGIES! our favorite restaurants for my dad’s birthday! that you can EAT CLEAN while ordering TAKE OUT! 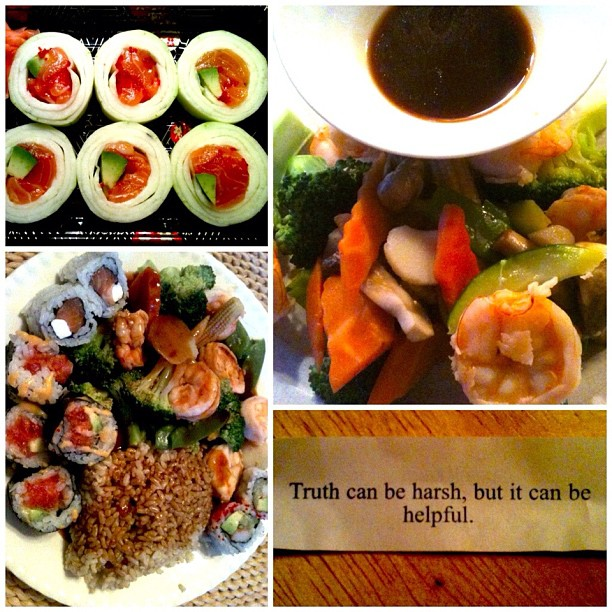 My dad ordered his favorite sushi rolls with some brown rice & steamed shrimp & veggies! Point for Dad on that one! I always say that everybody wants honesty but nobody wants to hear the truth. but personally I’d rather be told the truth instead of a lie. in the long run, you’ll appreciate the truth more than the lie. it really is easier to move forward from that point! A NEW RECIPE FOR YA! mix with nooch & salsa. Cut pepper in half and remove seeds. & serve over salad of choice! It’s such a yummy combination! & I uploaded some videos from back stage! Can’t wait to share them with you!! Would you rather be told the truth? What’s your favorite food to “ORDER IN” ? love the recipe too. eat the red peppers for me since i cant hahah i’ll find some replacements have a good day! If I “order in” I choose a salad because I can’t never find another healthy option. But you gave the best idea and also the best dish to order in a Japanese restaurant!! Thank you and enjoy your spring break! This all looks so good! Sushi is my favorite food to order in – but I’m actually going out for it tonight! Sushi is my favourite meal to order in! I almost never order in any other type of food. 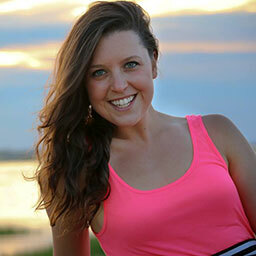 I’m so jealous that you’re on spring break! Have fun at home! Love the avocado/salmon/cucumber roll! Was it wrapped in cumber instead of rice? Such a smart idea! That is so true- the truth can hurt sometimes, but most of the time it is necessary! I like the quote “what you eat in private shows in public” ha its kinda harsh but so many people can relate to it! 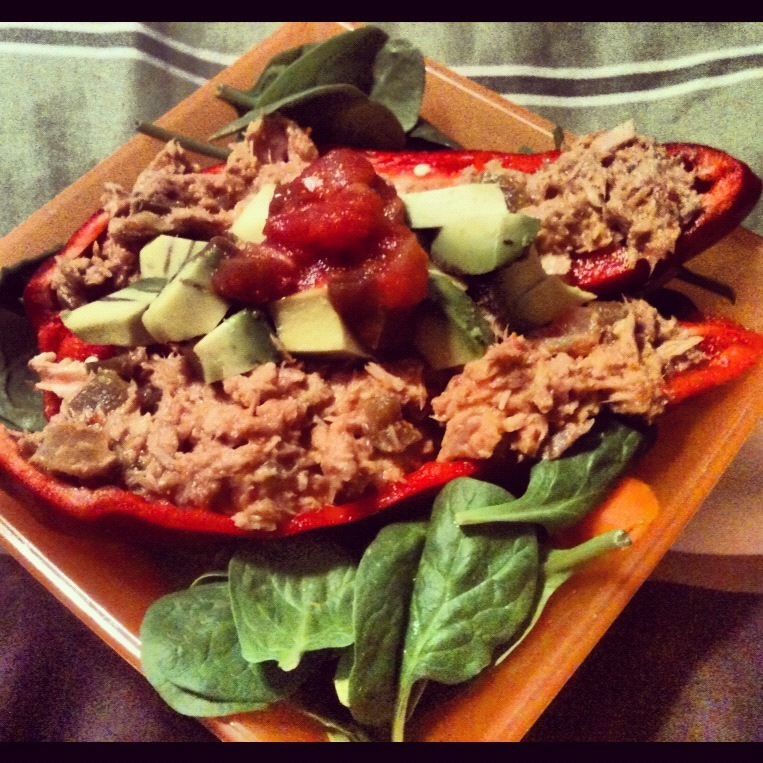 I’ve never thought to do Tuna in stuffed peppers, I always to lean ground turkey. Thanks for the idea!! can’t wait to see your competition eats!! we barely ever order in… if we do, it’s because we are at my parents or my in-laws house! when i go out to eat, i love getting salads with some type of protein.. i love, love, love salads and love ordering them with various veggies that i may not typically keep on hand at home! Yep I’d always rather hear the truth even if it hurts. I always hated when I heard people talk about me behind their back when I can take the truth. I definitely prefer sushi when I eat out! It sounds so nice to be on spring break. I miss that! Your eats look so good. So clean and so healthy. I need to get better at my diet, i have been seriously slacking. Yay for spring break! That must feel pretty fantastic Your eats are looking mighty tasty as usual lady… so healthy and nutritious but full of flavor! Enjoy your time at home! This is PERFECT. I just bought tons of tuna and didn’t think of putting in some nutritional yeast.